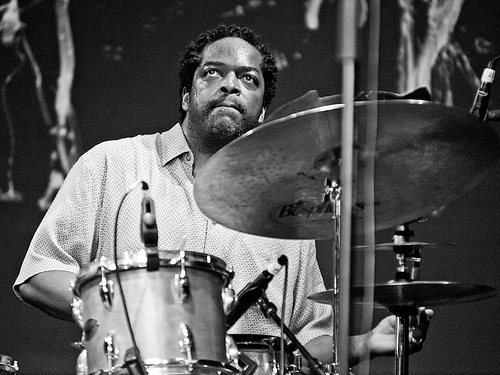 Gerald Cleaver is one of the New York jazz scene’s leading drummer and composers, who covers a wide range of stylistic ground. Having played with jazz masters Tommy Flanagan, Barry Harris and Ray Bryant as well as the leading lights of the AACM, Roscoe Mitchell, Muhal Richard Abrams, Wadada Leo Smith and Henry Threadgill, he is a product of many traditions within creative music. Cleaver is best known for his associations with Roscoe Mitchell, Charles Gayle, Miroslav Vitous, Mario Pavone, William Parker, Michael Formanek, Joe Morris, Jeremy Pelt, Craig Taborn and Yaron Herman. He is also the leader of the bands Uncle June (a reflection on the personal and familial challenges of Black Americans during The Great Migration featuring Tony Malaby, Andrew Bishop, Mat Maneri, Craig Taborn and Drew Gress), Violet Hour (a tribute to Detroit featuring Jeremy Pelt, JD Allen, Andrew Bishop, Ben Waltzer and Chris Lightcap), Black Host (a noisy avant-garde group featuring Pascal Niggenkemper, Cooper-Moore, Darius Jones and Brandon Seabrook) and Farmers By Nature (a free-improvising collective co-led with bassist William Parker and pianist Craig Taborn). Born 1963 and raised in Detroit, Cleaver is a product of the city’s rich music tradition. Inspired by his father, drummer John Cleaver, Jr. (whom Uncle June is named after), he began playing the drums at an early age. He later played violin in grade school and trumpet in junior high & high school. As a teenager he gained invaluable experience playing with Detroit jazz masters Ali Muhammad Jackson, Lamont Hamilton, Earl Van Riper, and Pancho Hagood. While attending the University of Michigan as a music education major he was awarded a National Endowment for the Arts Jazz Study Grant, to study with drummer Victor Lewis. He graduated in 1992 and began teaching in Detroit where he worked with Rodney Whitaker, Marcus Belgrave, Donald Walden, and with visiting musicians Hank Jones, Kenny Burrell, Frank Foster, Cecil Bridgewater, Eddie Harris, Howard Johnson, Diana Krall and Don Byron. In 1995 he accepted an appointment as assistant professor of Jazz Studies at the University of Michigan, and in 1998 also joined the jazz faculty at Michigan State University. He moved to New York in 2002 and has since focused exclusively on playing. Cleaver has played and recorded with a cornucopia of artists including Franck Amsallem, Tim Ries, Lotte Anker, Reggie Workman, Marilyn Crispell, Matt Shipp, Kevin Mahogany, Ralph Alessi, Jacky Terrasson, Jimmy Scott, Muhal Richard Abrams, Dave Douglas, Roy Nathanson, Tim Berne, Jeremy Pelt, Ellery Eskelin, Charles McPherson, David Torn, Terje Rypdal and Lou Reed.